Its coming to the end of fruit season. All that we have left is a bucket of old apples left over from the apple farm we went to about 2 months ago. Surprisingly, the apples are not moldy or infested with bugs, just a little soft is all. Im going to use them to make GAPS apple crisp again. 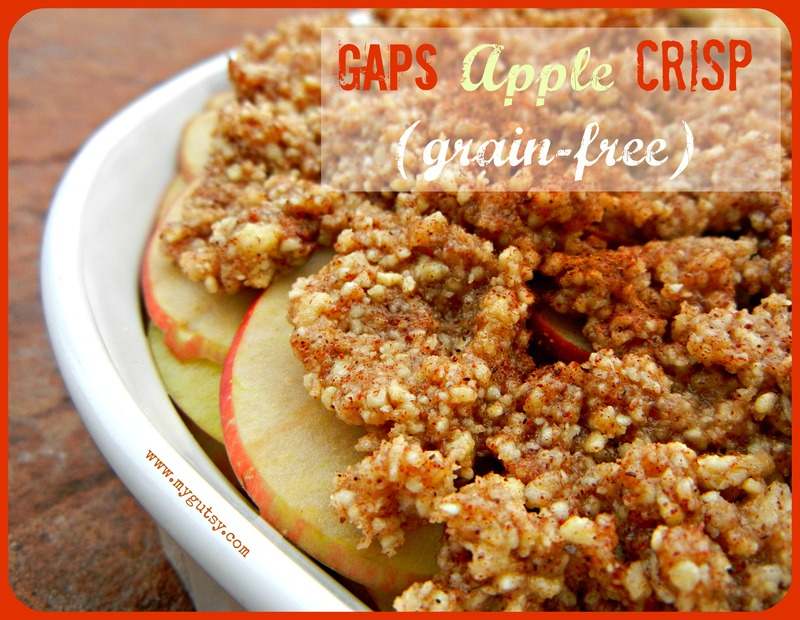 The first time I made this GAPS apple crisp was the day after we went apple picking. The kitchen smelled so good that day (crisp fall flavors and sweet juicy apples). Here is to another round of apple crisp! Enjoy. For the crumble topping you mean make it fine or coarse. If you want a fine topping, just use almond flour. If you want it more coarse, you are better off grinding your own blanched almonds and leaving them chunkier. 3. Tightly layer the apples in a baking dish and drizzle lemon juice over them once they are all in. 4. (If using blanched almonds) use a Cuisinart to pulse almonds until it looks like the consistency you want. 5. Pulse together ground almonds or almond flour, salt, cinnamon, maple syrup/honey, and cold butter (you can always mix it by hand too, but then you will have to cut the butter really small). 6. Evenly spread the crumble topping from step 5. onto the layered apples. 7. Bake for 80-90 minutes. I deliberately kept the oven at a low temperature to allow the apples to get soft while the crumble doesn’t get too dark. If your oven gets extra hot, make sure to check the crisp after an hour. Thanks for sharing in the Grateful GAPS Holiday Foods blog hop! I’ve been drooling over this recipe for a couple of days now. Can’t wait until I have some apples to make it! Can we use coconut flakes instead of Almond? yeah that would probably work great!